Karen Brown, known as "Punchi", was killed by a large pit bull in South Deering. UPDATE 08/06/18: An autopsy Sunday determined that Karen Brown, 57, died from multiple injuries inflicted by a dog. The manner of death was ruled accidental, according to the Cook County Medical Examiner's Office. Brown was viciously attacked by a loose pit bull on Saturday in the 10100 block of South Calhoun Avenue on Chicago's Far South Side. According to neighbors, the pit bull was kept in an unfenced backyard by owners who kept multiple dogs in crates. The owners of the pit bull vacated their home and fled after their dog brutally attacked and killed Karen Brown, according to neighbors. 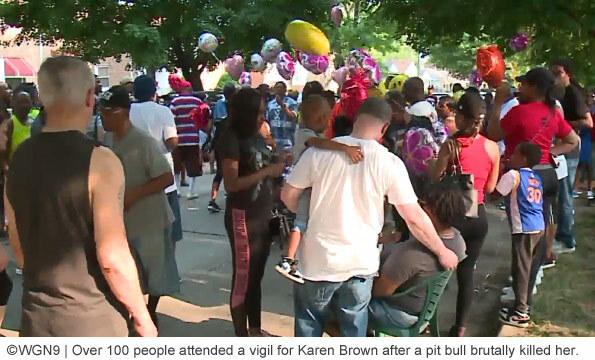 A community vigil was held Sunday at the scene of the deadly dog mauling. Over 100 people attended. Friends said that Brown was on her way to a home on the street to start house sitting when she was attacked. In addition to at least one previous attack, residents said the pit bull had long been a problem in the neighborhood. When police officers responded Saturday, a hail of gunfire was heard in the neighborhood. Officers fired up to 30 bullets at the pit bull, killing it. 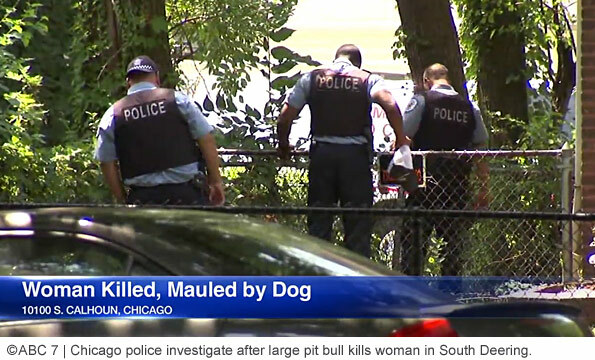 Chicago, IL - A 57-year old woman is dead after being mauled to death by a large pit bull, Chicago police said. The victim was in the 10100 block of South Calhoun Avenue in the South Deering neighborhood at 12:25 pm when the dog attacked, biting her neck and all over her body. A pair of police officers shot and killed the animal after it lunged at them. She was taken to University of Chicago Medical Center, where she was pronounced dead. Police continue to investigate. ABC 7 reports that residents knew the victim as a "jack of all trades" type in the neighborhood, like cutting grass and going to get groceries for neighbors. She could always be counted on to offer a helping hand. She was about to cut grass when the pit bull violently attacked her. 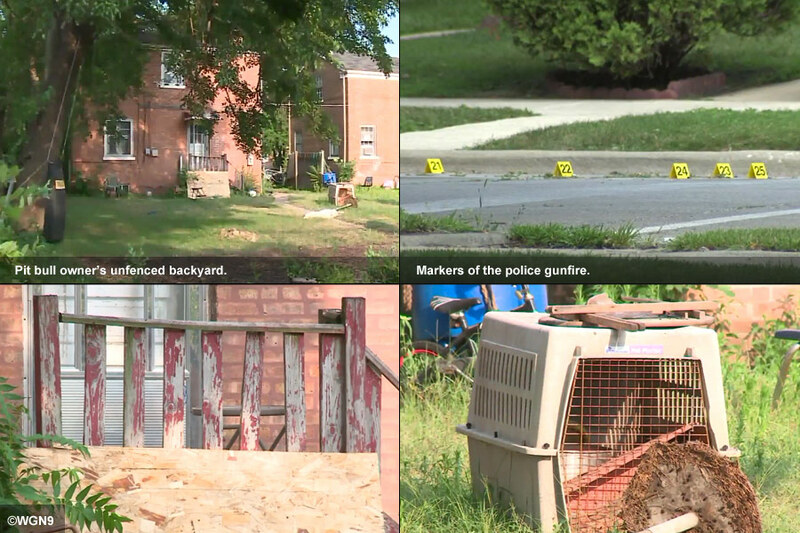 Chicago police and animal control officers remain at the scene of the deadly dog attack. Currently, officers are going door-to-door trying to find out who owned the pit bull and how the animal got loose. In it's evening broadcast, ABC 7 interviewed relative Laniece Jones who believes that special precautions should be in place for pit bulls. "If you have a pit bull, it should be put away, locked up -- something," she said. An unidentified neighbor said his friend Rick was attacked a week and a half ago by the same dog. "I don't know how [the owner] manages to get away with it, but he does. They should be held accountable for that. They really should. That's a murder," he said. Unfortunately, Illinois has the worst track record in the country when it comes to filing criminal charges after a fatal dog attack. From 2005 to 2017, canines killed 16 people in the state. Pit bulls were responsible for 81% (13) of these deaths. No charges were brought in any of these cases, including the death of James Nevils III. The dog's owner was issued two infractions. The child's grandfather was appalled, "My grandson’s gone forever, and all you get is two tickets?" 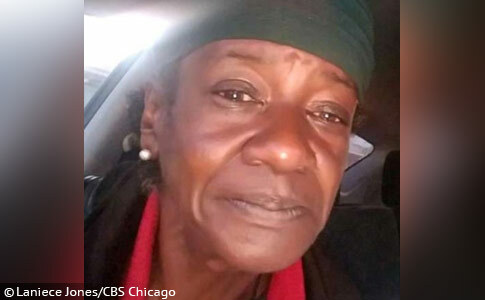 CBS Chicago confirmed the victim's name is Karen Brown. Her nickname was "Punchi." Family members say there will be a vigil at the scene of the fatal dog mauling Sunday at 6:00 pm. Here is an older lady making a few dollars and helping people out by mowing lawns and someone’s “pet” escapes and kills her. Why do we allow people to own “pets” that can go around randomly attacking and killing people? Why?? A beautiful woman brutally attacked and killed while she was outside to cut the grass! Ban the Pit Bulls already! This needs to stop! Well said bcazz. And this isn’t the first time running the lawnmower has trigger a pit bull attack. The owner should be charged with BOTH animal cruelty and manslaughter they trained this dog to be a vicious weapon and he delivered! To call this incident accidental, just confirms how uneducated our society has become. This dog breed should be banned from USA. It has no place in a civil society . This breed of dog was bred for blood sports and hunting wild boar. The genetics and DNA can never be bred out. They were developed in England and are now banned from their country. There is a lot of intimidation multiple cruel deaths of all different animals, children, innocent adapts being attacked by this breed at will. And the uneducated owners are not held responsible for such a lethal animal. This is beyond any measure of incompetence of a free and safe society . Ban this breed no fault of its own. It is what it is!! God bless each of you through this very traumatic time on so many levels!